There are two levels of Keywords for LEAP™: Site level, and Page level. Site level Keywords are those that are appropriate and meaningful to every page of your website, such as your company name, your main services or products. Page level Keywords are more specific to the content of the page: Leap™ Lenses would apply to some, but not all pages of this documentation guide. Set up a Keyword Group called 'default' or 'site. 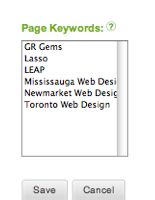 Set up a few Keywords that are the most significant for your website, and assign them to your default of site group. On your System Setting / LEAP Sites click the Edit wrench icon to edit your main website settings. Use the selector to choose the Keyword Group that you set up containing your default or site level keywords, the click Save. Your site will now have all of the keywords from that group appear in the code that serarch engines read on each page on your website. When a page is created, keywords that already exist in the system can be selected. After the page is created, use the Page Magnifyer tool from the LEAP™ toolbar to select or add new keywords to the page.